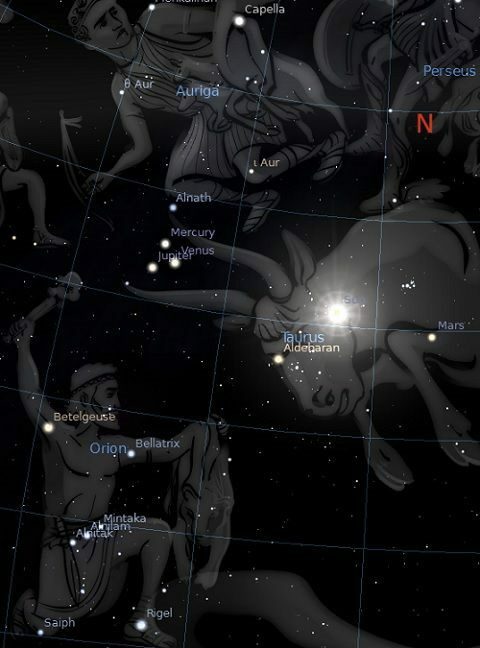 At dusk, during the last week of May 2013, we will be able to see a rare beauty in the sky. Mercury, Venus, and Jupiter line up together between the Horns of the Bull, near 23 degrees Gemini in the zodiac. This triple conjunction (within 2 degrees), has occurred only five times in the last century, the most recent being on the 11th of May, 2011, at 24 degrees Aries. We will have to wait another 43 years to see this wonder again, when they come together at 25 degrees Pisces on the 27th of February, 2058. So those of us on the down hill slope better get a good eyeful this time. This triple conjunction will not only look good, it will feel good, too. Venus and Jupiter are the two most fortunate of the planets. Mercury, if fickle, will definitely be on his best behavior in this company. Mercury – thoughts and words, Venus – love and money, Jupiter – abundance and fortune. However, the greater influence on this triple conjunction will come from the Northern Horn of the Bull, and the Belt of Orion. The Mercury Jupiter conjunction occurs at 23°♊12′, closer to the Northern Horn, El Nath. The Venus Jupiter conjunction 36 hours later at 23°♊32′, is closer in longitude the middle star of the Belt of Orion, Alnilam. This is where the astrological interpretation gets a bit tricky, because El Nath is fortunate and Alnilam can cause some problems. Both stars are of the same magnitude, but with El Nath being so close to the path of these planets, as you can see below, it’s more fortunate influence should prevail. Not only that, but as I mentioned earlier, the nature of these planets is very fortunate. El Nath is a fortunate star linked to eminence and success. With Mercury, “favorable for gain”. With Venus, “favorable for gain”. With Jupiter, “favorable for gain”. Alnilam, as part of the Belt of Orion, is supposed to give good fortune and lasting happiness. However with the planets involved in this triple conjunction, there are some things to watch for. With Mercury, “domestic disharmony”. With Venus, “Trouble through love affairs”. With Jupiter, “trouble through relatives”. If there is to be a difference, then the 26th and 27th of May would be more fortunate, having greater influence over financial matters. The 28th and 29th would be less so, with a greater impact on relationships. Below is the list of times when it is possible that the good fortune of this alignment may wear off just a little. Finance and business would be most favorable for a few days before this time, and more care would be needed in personal relationships for a day or two after this time. Los Angeles California USA, Vancouver Canada – 3 pm PDT, Mon 27th. New York and Florida USA, Toronto Canada – 6 pm EDT, Mon 27th. London UK – 11 pm BST, Mon 27th. New Delhi India – 4 am IST, Tue 28th. Bangkok Thailand – 5 am ICT, Tue 28th. Sydney Australia – 8 am AEST, Tue 28th. What happened to me on the 11th may 2011 was to finish a book I was translating and to deliver two nice scripts for museums… I don´t know what to do neither how to assert my self when people envy my creations and try to eclipse them…! Or maybe I just want to much attention. I feel rather confused. Thankyou for the warning. My guide keeps saying to be patient and to be humble. Sun will be transiting Aldebarán. And the conj. will be on my 12th H.
I’ve got a quick question . I’d like to know the international time difference. I’m in uk , so how many hours are you front or behind ? As u said that good days are 26,27 may . Does that mean is it 27,28 in UK . Sorry a bit confused . Its actually scheduled for Sunday evening 26th, so that seems to have been a good choice eh? I have this triple conjunction Natal (12th. House in Scorpio), should it have a greater impact (7th House by Transit)?? Venus, mercury, jupiter transiting natal uranus on 5 th house cusp…Any clues? Yaz, if i were you i’d buy a lotto ticket. 5th house cusp; gambling. 5th house also related to children and creativity. Well past the date now but my guess, without seeing aspects to the natal Uranus, would have been unexpected romance or just plain delight – Mercury bringing ideas, creative breakthroughs, play, Venus, love – especially in the house of romance and Jupiter – very good luck. Gamble for fun? How did it go?